Clearly, I am four years old. Actually, truth be told, I'm twenty-three years old. I take out my wallet, look at my driver's license, and this is confirmed as truth. Further investigations into my murky past through birth certificates and passports again state that, my name is Dillon Font, and I was born in 1981. I have facial hair and a strong ability to dress myself efficiently and with style. I do my own taxes and somehow pay my bills. However, strong evidence to the contrary has been brought to my attention, indicating that my true age is that of a very young child. And not just any child; we're talking girl child here. This all becomes interesting, as well as overwhelmingly confusing, considering I've spent all this time discussing how most media aimed at kids doesn't excite me as it once did. No, I need my comics and animation to speak to me, to my demographic, with complicated and morose stories with complex characters, excellent dialogue, and beautiful art and cinematography. Give me darkness. Give me melancholia. These stories of simple adventures and brightly colored hair just don't hold the same kind of torch they did once for me. Sigh. But give me teen girls in sailor uniforms fighting evil, and I melt. 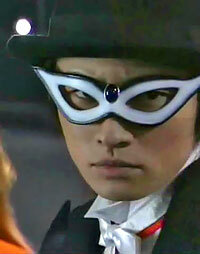 No matter how I run from it, I guess I'm a Moonie from way back, and the live action series is just pulling me back in. I resisted. Believe me, I fought. I downloaded the first episode way back when it started, and as much as my soul kept insisting for more, I shoved it down, cast it into the darkness of my inner child, turned back to my New York Times Arts and Leisure section, the new episode of Planetes, and a cup of tea. Then it all ends, the façade trembles and falls, and I sit there, hugging my pillow, wistfully wishing for the ability to jump through time so I can see the next episode already. Episode 26 came online, and I spent a week downloading and inhaling each episode like the sweetest of waters. I'm hooked, full line and sinker. And addiction tastes all the better with friends, so it is time, I think, to make you see the light, and coincidentally join me in the dark side. First, it's important to understand that Sailor Moon as a commercial property never really died in Japan. Even after the manga and anime series ended their five-year run in February of 1997, Sailor Moon still kept a stranglehold, if admittedly a lesser one than at its height, on the children of Japan, primarily through the surprising continuation of the Sailor Moon live action musicals that had started around 1993. What many American fans had assumed would die out shortly after their plotlines finished ended up keeping a strong fanbase in Japan, with multiple different productions of Sailor Moon musicals. Based on the longevity that Sailor Moon itself maintained and the success of the musicals, TV execs, this time working more closely with original creator Naoko Takeuchi, created a live-action remake of the original manga, given the slightly different English title (although same Japanese title) of Pretty Guardian Sailor Moon. The basic structure of the story remains true from both previous manga and anime incarnations. Centuries after the collapse of the Moon Kingdom, as well as the decimation of Earth, certain warriors and royalty are reborn today, ready to repeat fate as the Dark Kingdom marshals its forces to rise up again and take over Earth. However, just as the Dark Kingdom is crawling back from the abyss, so too do the five warriors who protected the Moon Kingdom, the Sailor Soldiers. Aided by two talking cats and the mysterious Tuxedo Mask, the five Sailor Soldiers fight back against the evil invasion, all while trying to gather the memories of their previous existence. Of course, simply telling the same story again is rarely ever a good marketing tactic, early Adam Sandler movies be damned. The creators of the Pretty Guardian Sailor Moon have put a lot of thought into how to effectively tell the first story arc of the infinitely popular Sailor Moon, aiming it at a new generation of Moonies, while still offering something interesting for old-school fans (such as myself) to enjoy. The chief positive change to the series comes in the new portrayals of all the characters of the Sailor Moon universe. Neither the anime, nor even the manga has quite the level of depth in the characters that is found in the live-action incarnation. Each of the soldiers has a more distinct personality, each with quirks, personal goals, and anxieties that not only separate these characters from their prior incarnations, but causes more gaps and issues between the warriors. Even Queen Beryl and the Four Generals become more than just The Big Bad Evil, but each of them clearly has their own goals and aspirations that may or may not serve the Dark Kingdom's quest for complete conquest. For all that this incarnation of the story is probably aimed at a younger audience than the manga and the anime, we see here the characters less like concepts and more like people, each of whom might feel extreme loneliness, or not understand how to interact with boys, or would rather spend their energies pursuing their own goals than that of an evil organization. On both sides, we start seeing dissension in the ranks, as the Sailor Soldiers end up spending less and less time fighting evil together, or even talking regularly, just as some of the generals are more interested in obtaining greater power for themselves than for the Dark Kingdom. Even the bland-as-sand Tuxedo Mask becomes a faceted and intriguing character, one who contends with his wish for both his past and for the Princess, while at the same time attempting to maintain his daily life routine, including a relationship with childhood friend and current lover, Hina. Sailor Moon, also known as Usagi Tsukino, is probably the greatest, if subtle, changeover from her previous incarnations, at the very least from her character in the anime. While still somewhat whiny, this Sailor Moon is actually a capable and effective member of the Sailor Soldiers. She actually does go into physical fights and lands blows, and isn't just there to land the final magic attack that would do in the enemy in each episode of the anime. While she is still the kind of girl who people depend on and is a great friend, she actually does show that she can fight effectively against the enemy time and again, an ability she lacked in much of the anime, being more prone to hysterically missing the foe and falling onto the ground in waterfall-like tears. She comes across as surprisingly competent when faced with Kunihiko Ikuhara's Usagi, and I certainly couldn't be happier. Even with just these different realizations of Sailor Moon and her army, already we are seeing a different kind of storyline unfold, and based on differing character reactions, the plot takes on new and fascinating directions. One of the better directions that the story has taken here involves the idea of Sailor Venus masquerading as the Princess in order to protect Sailor Moon. This was an idea that was done up somewhat in the manga, but it is brought into a beautiful space within the live-action series. Throughout most of the first 26 episodes, Sailor Venus openly identifies herself as the Princess to the other soldiers and to the enemy, taunting the enemy to chase after her and the fake Silver Crystal in her possession, in order to take the heat off of the real Moon Princess. Of course, the one burning question that is floating around in your minds revolves around the battle sequences. How does live-action series interpret the battle scenes? Initially, rather badly and cheesy-like. Betraying the show's roots from the musicals, the first fifteen episodes worth of fighting basically boil down to the soldiers doing elaborate cartwheels and imaginative dancing/gymnastics to confuse the enemy enough to blast them with their magic attacks. It's even cheesier than it sounds, and pretty much deflates any sort of realism that a show with sailor-suited teens fighting evil may already have. However, the fighting does become more realistic as the series goes on, with more kicks and punches connecting to the daily youma than before. The great, if initially frustrating, aspect of Pretty Guardian Sailor Moon thus far is that it's definitely a show that grows better as it goes on. While it starts out in a sorta "I don't know if this is crap or something worthwhile" vein, the series progresses into showcasing some clever storytelling, deep character growth, and excellent interactions between the characters. 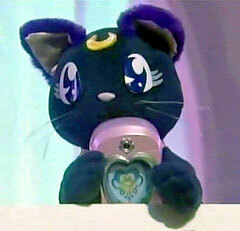 One can even forgive Luna and Artemis being stuffed cat dolls after a while. I'll admit, I'm as surprised as anyone, but Pretty Guardian Sailor Moon is a quality show. As long as you take the cheesiness with a grain of salt and fun, you'll have a great time with this show. "Please let this keep going till they get to the Outer Senshi." And life comes full circle, and I am four years old. Life, however, is just a little bit sweet.